The honey locust (Gleditsia triacanthos L.) is a legume tree up to 25-45 m high. It is deciduous with a long leaf retention period. It has a deep taproot growing down 3-6 m deep and few lateral roots that make it suitable for agroforestry systems (Postma, 2005). In young plants, stems bear very large, flat thorns and the young trees form very dense thorny thickets (FAO, 2012). The older tree has an erect, short trunk, 50-90 cm in diameter, which is many branched and forms a large open and spreading crown (Seiler et al., 2011; Orwa et al., 2009). The branches are covered with clusters of large and flat thorns (Orwa et al., 2009; Ong, 2001). The leaves are sparse, alternate, 15-20 cm long, pinnately compound, bearing bright green leaflets that are oblong, small (25-40 mm long x 15 mm broad) and sparse (Seiler et al., 2011; Orwa et al., 2009; Postma, 2005). The inflorescence is a fragrant, pending raceme, up to 7 cm long (Seiler et al., 2011). The small and greenish-white flowers can be male (preponderant), female or hermaphrodite and are generally found on different branches of the same tree (Seiler et al., 2011; Orwa et al., 2009). Fruits are flat, curved, many seeded pods, 15-40 cm long, dark shining brown and leathery, that become twisted as they mature. The pods contain 0.5-1.5 cm long, smooth beanlike seeds embedded in a pulpy tissue (Seiler et al., 2011; Ong, 2001). Pods mature during late summer and early autumn and are shed from the tree during winter without opening (FAO, 2012). The honey locust tree has many uses. The sweet pulp has always attracted animals and people alike, when better sweets are not available. The pods are readily eaten by many wild and domesticated animal species, including cattle, goats, deer, squirrel, rabbits, quail and starlings (Duke, 1983). The pods are edible and can be used as a vegetable. The pod pulp is fermented to produce alcoholic or non-alcoholic beverage (Ecocrop, 2012). Roasted seeds are used as a coffee substitute (Orwa et al., 2009). Pods and foliage are a valuable fodder for all classes of livestock and the honey locust tree is particularly suited as a fodder tree in drier areas. The flowers are a source of nectar for bees, which gives the tree its vernacular name. The hard timber is used for firewood, construction and various crafts (Ecocrop, 2012; Orwa et al., 2009). The trunk, pods and bark are used in ethno-medicine. The honey locust tree is used for environmental purposes (see Environmental impact), as an agroforestry species and as an ornamental species in gardens, parks and along highways (Orwa et al., 2009). Gleditsia triacanthos originated from the Eastern USA and is widely naturalized in the Mediterranean area, in the Middle-East, in Asia and Northern Australia (Ong, 2001). It is a fast-growing tree that may begin fruiting 3 years after planting. Its adaptability is outstanding: this hardy species can withstand heavy frosts (it is found on the Russian steppes) and a six-month dry period (it is found in the South-African veld and the Australian outback) (NRC, 1979). Gleditsia triacanthos occurs naturally within 28-40°N, in areas where annual rainfall ranges from 510 to 1520 mm. In tropical and subtropical regions, it can be found from sea level up to an altitude of 760 m but it can be planted up to 1500-2200 m, and in some circumstances above 2500 m (Ecocrop, 2012). The honey locust grows well in most soils, even poor ones provided they are well-drained (Postma, 2005). However it prefers the moist, deep and alluvial soils of floodplains or irrigated areas (FAO, 2012; Orwa et al., 2009). Gleditsia triacanthos has some tolerance to salt, which may be useful in irrigated areas. It does not withstand shaded conditions and may suffer from high winds and fire (Ecocrop, 2012; Orwa et al., 2009). It is not suited for maritime areas (Postma, 2005). Pods and seeds intended for feeding cattle, horses or pigs should be ground as the seeds are not easily digested (Wilson, 2006; Gold, 1997). However, for sheep, whole pods should be preferred provided that they are sugar-rich. Grinding is not only expensive, but ground pods have a short transit time, resulting in reduced degradability (Papanastasis et al., 1999). Gleditsia triacanthos is mainly grown for its pods, but young seedlings and coppice regrowths may be valuable fodder. It begins bearing pods 3 years after planting and it can produce 20-75 kg pods/tree within 8 years. Pod yield is in the 2-2.5 t DM range (Orwa et al., 2009; Dupraz et al., 1993). 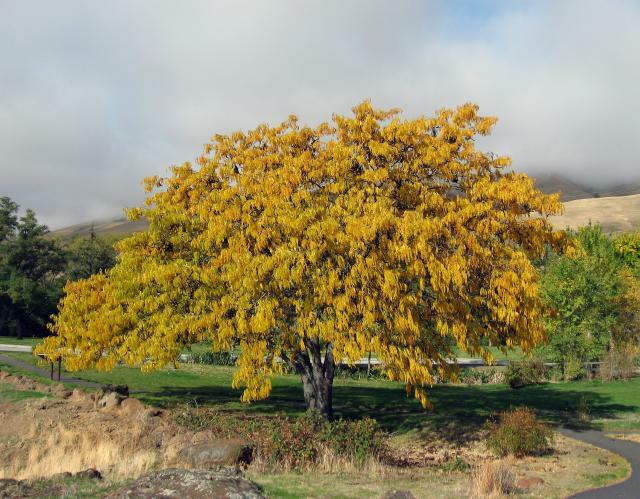 In Greece and in the USA, the honey locust did not compare favourably with Robinia pseudoacacia as it had a much lower DM yield (Ainalis et al., 1998; Burner et al., 2005). In the USA, flowering occurs in late spring: the trees shed their pods from mid-September through the winter, thus providing feed during a period of scarcity (Orwa et al., 2009). Once the pods have been eaten by ruminants, the undigested seeds are broadcast through dung. The seedlings have a high biomass production potential (up to 7 t DM/ha) and coppice regrowth has a high protein content combined with low lignin levels (Baertsche et al., 1986). The young seedlings and the regrowth have soft thorns that can be grazed by livestock. Twigs and leaves can be lopped and used in cut-and-carry feeding systems, or browsed directly by cattle (Wilson, 2006). Gleditsia triacanthos has a deep tap-root and is thus helpful for soil erosion control. In agroforestry systems, it may be planted with living mulch (such as clover) and this association provides reliable cover to the soil (FAO, 2012). In Central Asia, the honey locust and Robinia pseudoacacia are both used to improve degraded agricultural land so that dairy production can be introduced, based on foliage trees (Djumaeva et al., 2009). Honey locust trees are often used as windbreaks (FAO, 2012; Orwa et al., 2009). Though Gleditsia are leguminous species, they have long been considered to be non N-fixing since their roots do not develop nodules (Orwa et al., 2009). However, N-fixing ability without nodule formation has now been demonstrated in Gleditsia spp. (Bryan et al., 1996). The honey locust has a good potential for silvopastoral systems. It provides light shade and its deep tap-root does not compete with the shallower roots of grasses or legumes used for pastures (Orwa et al., 2009). Gleditsia triacanthos planted at medium density had a positive effect on forage yield and quality (especially on crude protein content) (Buergler et al., 2006). Gleditsia triancanthos is considered as an invasive species in numerous parts of the world, for instance in Australia and South Africa. It can out-compete and replace native vegetation: it destroys pastures by smothering desirable grass species, forms dense thickets that block stock access to waterways and reduce stream flow, and creates dense monocultures that provide a haven for pests. Its sharp spines can inflict serious injuries and infections to humans and livestock, even after the plant is dead (Australian Governement, 2018; SAGIC, 2018). Honey locust pods are known for their sweetness, which is due to their high sugar content. However, the amount of soluble carbohydrates is extremely variable and depends on many factors, including variety and stage of maturity. Values range from 10 to 18% DM for water-soluble carbohydrates (Kamalak et al., 2012) and from 10 to 38% for total sugars (Le Houérou, 1985). Much lower as well as much higher values have also been reported (Bruno-Soares et al., 2003). As a result, using honey locust pods for their sugar content should be considered only after having analysed them. The pods are relatively poor in protein (7-13% DM) and moderately rich in fibre (crude fibre 13-22% DM; NDF 22-44% DM) (Bruno-Soares et al., 2003; Kamalak et al., 2012; Pereira, 2000; Feedipedia, 2013). The lignin content is high (7-18% DM) (Feedipedia, 2013). Honey locust seeds are richer in protein (20-30% DM) than the pods but contain lower or similar amounts of cell wall constituents (ADF 13-15% DM) and much less lignin (less than 2% DM) (Papanastasis et al., 1999). Honey locust browses contains about 16-18% protein in the DM and 22-25% ADF (Baertsche et al., 1986; Papanastasis et al., 1999; Bruno-Soares et al., 2002). Honey locust trees bear large flat thorns (up to 35 cm long) that may injure humans and livestock and damage tractor tyres. Thornless trees (Gleditsia triacanthos inermis) are obtained through grafting (Wilson, 2006). Honey locust pods are rich in condensed tannins, with reported values ranging from 2.8 to 14.8% DM (Bruno-Soares et al., 2003; Kamalak et al., 2012). Total phenols vary between 4 to 14% (Bruno-Soares et al., 2002). Saponins (5.2% DM) have also been found in the pods (Bruno-Soares et al., 2003). Honey locust pods are highly palatable and sheep eat them readily (Bruno-Soares et al., 2003; Papanastasis et al., 1999). In Portugal, sheep showed selective behaviour, choosing the pods over other ingredients such as hay and soybean meal. They also selected the teguments and rejected the seeds (Bruno-Soares et al., 2003). In a similar experiment in France, alfalfa was preferred at the beginning of the experiment, but after some weeks some animals clearly preferred Gleditsia pods to alfalfa (Papanastasis et al., 1999). The animals ingested 1 kg/d of pods in the Portuguese study (Bruno-Soares et al., 2003). This value was the initial intake in the French study but was raised to 1.4 kg/d (68 g/kg W0.75) after 2 weeks, when it appeared that the sheep could eat more pods. Ad libitum daily ingestions of 2.3 kg of pods were recorded (Papanastasis et al., 1999). 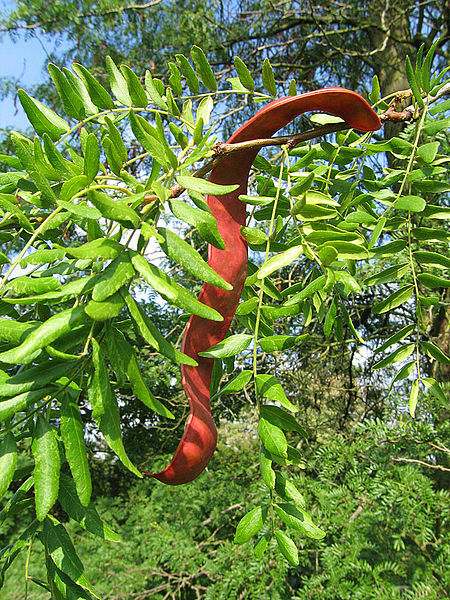 In the French study, sheep fed honey locust pods gained 135 to 178 g/d (Dupraz et al., 1993) and it was concluded that Gleditsia triacanthos pods are a valuable feed that could provide sheep not only with maintenance requirements but also with production requirements (Papanastasis et al., 1999). Values for OM digestibility obtained from in vivo or in vitro gas production studies range from 50 to 67% (Bruno-Soares et al., 2003; Papanastasis et al., 1999; Kamalak et al., 2012). The ME value derived from in vitro gas production studies ranged from 8.8 to 9.9 MJ ME/kg DM (Kamalak et al., 2012). The use of polyethylene glycol (PEG), by counteracting the effects of tannins, was found to increase the OM digestibility values by 6 to 15% (Kamalak et al., 2012). Gleditsia triacanthos pods should be fed to sheep whole and mixed with bulky feed. Sugar-rich varieties with soft seeds should be used. Such seeds are broken early during ingestion or rumination and result in high protein digestibility (Papanastasis et al., 1999). The in vivo DM digestibility values of honey locust seeds reported on sheep ranged from 62 to 88%, depending on the variety. In 41.5 kg sheep fed for a week a diet based on honey locust seeds (0.5 kg), dehydrated alfalfa (0.285 kg) and hay (0.5 kg), DM intake ranged from 21 to 30 g/kg W0.75 and average daily gain ranged from 184 to 288 g/d (Foroughbakhch et al., 2007). Earlier studies estimated that young leaves had a nutritive value similar to those of alfalfa (Bruno-Soares et al., 2002). Honey locust is relished by goats, who spent a lot of time browsing it. However, it was considered of lower value for goats than the Persian silk tree (Albizia julibrissin) and the black locust (Robinia pseudoacacia) as it did not provide sufficient quantities of forage (Addlestone et al., 1999). No specific study on the utilization of any part of the honey locust in rabbit feeding experiments seems available in international literature. However, young trees are very frequently browsed by wild rabbits (Putod, 1982; Swihart et al., 1983), making physical protection absolutely necessary after planting (Pearce et al., 1940; Sharrow, 2001). When distributed to domestic rabbits, honey locust leaves and fresh pods were well appreciated. Dried pods were less appreciated but also consumed, as well as the seeds (Putod, 1982). Papanastasis, V. P. ; Tsiouvaras, C. N. ; Dini-Papanastasi, O. ; Vaitsis, T. ; String, L. ; Ceret, C. F. ; Dupraz, C. ; Armand, D. ; Meuret, M. ; Olea, L., 1999. Selection and utilization of cultivated fodder trees and shrubs in the Mediterranean Region. Options Méditerranéennes : Série B. Etudes et Recherches, n° 23, 93 p.
Pereira, B. A. M., 2000. Aspects of the nutritive Value of Gleditsia triacanthos pods as fodder for ruminants. Implications in the interest of the species for improving the pastoral systems in Center and South of Portugal. Master of Technical University of Lisbon, Portugal, 112 pp. Postma, M., 2005. It’s all in the mix: Agroforestry, a prospective land use system for the Netherlands. In: Postma, M. MSc. Thesis Plant Production Systems, Department of Plant Sciences, Wageningen University, The Netherlands.